I have recently been researching the children of Elizabeth Ann Ball, in order to determine if there were more grandchildren I didn’t have in my tree yet. In this post, I will share articles I found for her son Harry Sylvester Oliver, that helped me determine how many children he had, and what their names were. First, I looked for any articles for “Harry Sylvester Oliver”, and the only result was his obituary. (Millaa Millaa) and Mrs. S.
I then went searching for any articles for “H.S.Oliver”, in order to try and find marriage or engagement notices for his children. The first article was the marriage notice for his youngest son, John William Oliver. 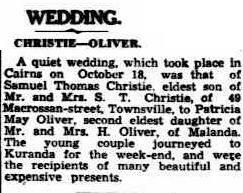 The next article found was the marriage notice for his son, Edward James Oliver. And the third was the engagement notice for his son, Henry Sylvester Oliver. This notice showed that Patricia was the Mrs. S. Christie on her father’s death notice, and that she was the second eldest daughter of Harry and Annie. 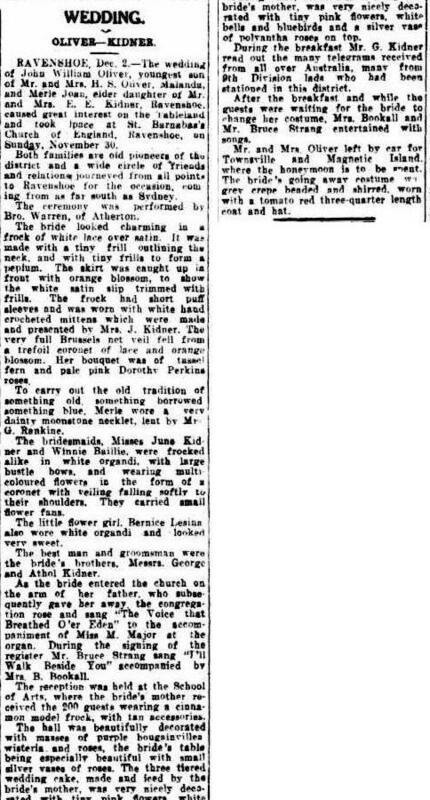 I then turned to the Queensland Births Deaths and Marriages, this time looking for the surname Lynch, mother Annie, from 1910 to 1916, and found the entry for Agnes Rose Lynch in 1913, mother Annie Julia (registration no. C11318). I then searched the Electoral rolls and found Agnes Rose Taylor in the 1943 Electoral roll for the state Queensland, district Kennedy, Subdistrict Atherton. She was living at Malanda. There was also a William Frederick Taylor on the same page. I then found a marriage of Agnes Rose Oliver to William Frederick Taylor in 1941 (registration no. C1852). I was unable to find a marriage notice for Agnes and William.